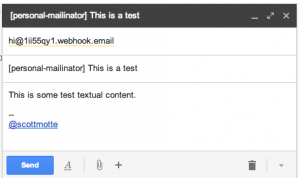 I like Mailinator. I use it all the time. However, it has had some downtime recently at inopportune times for me. My friend Joël had the idea of creating one’s own disposable email like Mailinator’s. In this post, I’m going to show you how to do just that. It turns out it is pretty easy using modern tools. 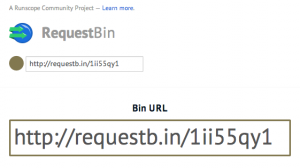 Visit RequestBin and create a bin. 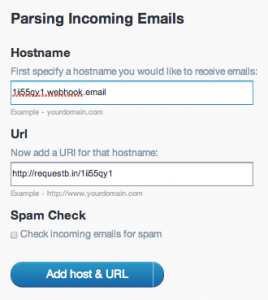 Visit SendGrid’s Parse Webhook Settings. Set the hostname to 1ii55qy1.webhook.email. Set the url to the url of the bin you created above. Go to your email and send an email to hi@1ii55qy1.webhook.email. Refresh the request bin page you generated in Step 1. That’s it. You’re done! You’ll see the contents of the email in the bin you created above. That was pretty easy, but could be easier. I’ve combined these actions into an open source repo called disposable-email. It makes this process a little easier on you. You can use the demo here or you can host your own by following the instructions here. Combining SendGrid’s Parse Webhook with other great tools can result in fast-to-create web applications. For more details and use cases, download the Parse Webhook Guide for free now.